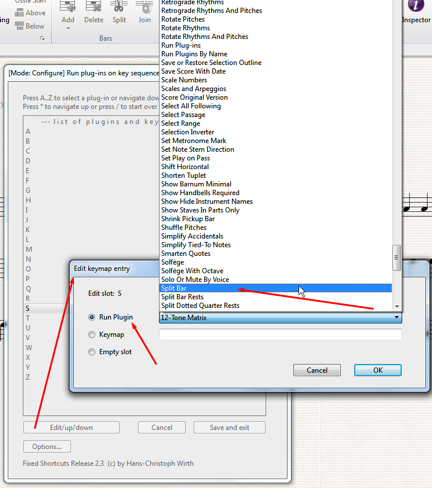 This blog post is written by Bob Zawalich, creator of hundreds of useful plug-ins for Sibelius. Read on to learn how to improve your workflow by quickly and easily accessing your favorite plug-ins. I tend to run a lot of plugins, but I often run one a lot and then not again for a while. So at any given time I might have a set of plugins that I would like quick access to without having to reset shortcuts for each of them. 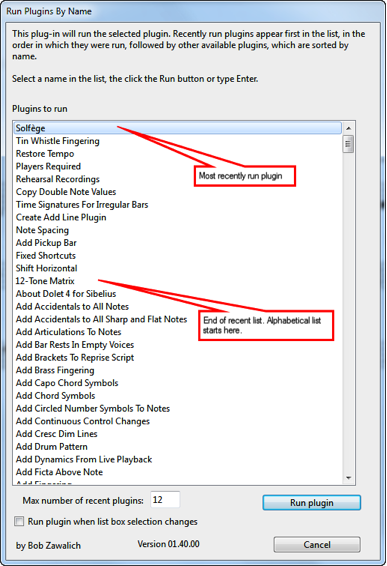 I find two plugins to be very useful for setting up a reasonably-sized working set of plugins: Run Plugins By Name (in plugin category Other), and Hans-Christoph Wirth’s Fixed Plug-in Shortcuts (in plugin category Menus and Shortcuts). Though the latter says it is for Windows only, I have used it successfully on Macs in recent versions of Sibelius. In both cases, you can assign a shortcut key to the single plugin, and it will give you a list of other plugins to run. I will describe Run Plugins By Name first, because I think it is simpler, but you may well prefer to use Fixed Plug-In Shortcuts, depending on your workflow. The next time you run Run Plugins By Name the last plugin you invoked from the plugin will be at the top of the list, and you can just click OK to run it. Up to 12 (by default, though you can change this) recently run plugins will be at the top of the list, in the order run, followed by the remaining plugins in name order. So if your working set of plugins is around 12, they will show up at the top of the list when you run Run Plugins By Name, and so should be very easy to find. This plugin is useful if you change the plugins you are using often, or if you have only a few you ever run. There is very little setup required, so it’s trivial to find and run a plugin if you know its name. Fixed Plug-in Shortcuts has been around for a long time. It works really well for giving you sets of plugins that you will always have access to. It lets you assign meaningful “sub-shortcut” names to various plugins. The one disadvantage of this plugin is that it takes some initial setup. 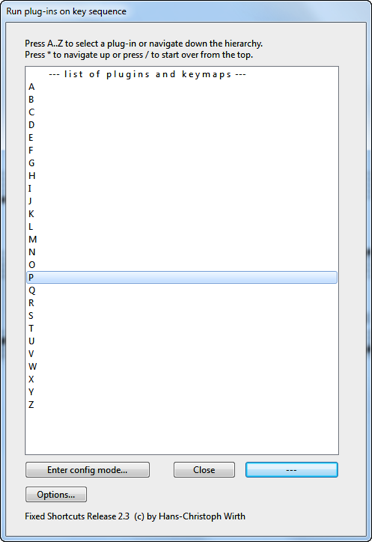 Choose the empty “S” slot and click Enter Config Mode… You will see another dialog. Click on Edit/Up/Down, and you will see a sorted list of plugins. Click on the Run plugin radio button, and choose the plugins you want (Split Bar, in this case) from the list. When you hit OK, Split Bar will be in the S slot. Choose Save and exit to return to the main menu. From now on, if you run Fixed Plug-in Shortcuts and type S, you will run the Split Bar plugin. Choose appropriate slots for the other plugins you want. (Note that, in my example, Edit Instrument Name and Exchange Staff Contents both start with E, so you need to decide the most useful shortcut). 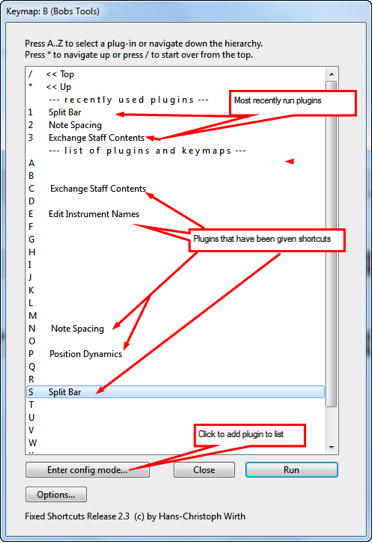 You have an easily accessible set of 26 (A – Z) plugins, plus the plugin has a mechanism for creating multiple keymaps, which are named sets of 26 plugins, so you can set up multiple sets of plugins for different contexts. So this really works well once you get past the initial setup, and if you use the same plugins all the time, it’s a convenient way to make them accessible without have to set up shortcuts for each of them. When you run either of these plugins, it may warn you that you have multiple copies of the same plugin in different folders. Duplicate plugins confuse Run Plugins By Name and Fixed Plug-in Shortcuts, and they may not run the version you would want them to run, so if you see these messages, please remove any duplicate plugins if that is possible. Only plugins that are run from within Run Plugins By Name or Fixed Plug-in Shortcuts will appear on their lists of recently run plugins. If you go to the plugins menu and run a plugin directly, this plugin will not appear in the list of recent plugins. Each of the plugins maintain separate lists, so running a plugin in Run Plugins By Name will not affect the list in Fixed Plug-in Shortcuts. I find either of these plugins easier to use than assigning separate keyboard shortcuts for each plugin, plus having a alphabetic list makes finding plugins easier. You can assign a single shortcut to one of these “master plugins”, and have easy access to a number of plugins. Post updated on December 4, 2012 to more clearly explain that these plugins maintain their own lists of recently run plugins. I have learned to go to the plugins menu for anything that seems missing from the primary menu. Whatever paradigm you are in with Sibelius, there is a host of plugins waiting to help. I should note that in both plugins, only plugins that these plugins run will be included in the list of recently run plugins. So if you run Resize Bar (for example) from within Run Plugins By Name, its name will appear in the list the next time you run Run Plugins By Name. If you go to the plugins menu and run Resize Bar directly, Run Plugins By Name will know nothing about the fact that it was run, and the name will not appear in Run Plugins By Name. Both these plugins also warn you if you have multiple plugins with the same names. They cannot differentiate which plugin to run, so they advise you to remove duplicate plugins to avoid running the wrong copy of the plugin, since the copies may be different..